miso tired. (long parenthesis, here goes anyways: school and clubs and sometimes sleep and hanging out and sometimes cooking and getting a mentee! i wasn’t planning on being a mentor since i’m already a board member for the club, but it happened and i’m excited to corrupt get to know my mentee. also may or may not have impulsively signed up to get another mentee for another club, oops). miso want cake. miso unmotivated. 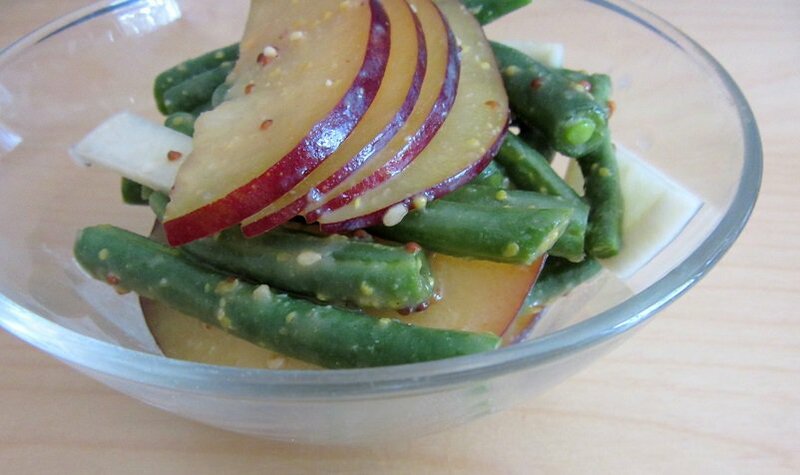 let’s stop the bad miso puns, and get to the recipe for plum and green bean salad with miso dressing. really, this should just be renamed to “plum and crunchy green vegetable salad with any dressing.” i’ve done this with green beans and sugar snap peas, with miso dressing and hoisin dressing, and i love it allll the ways. i prefer the hoisin dressing because i feel like it’s a little lighter and helps the produce come through more, but the miso dressing is just as tasty. there’s recipes for both dressings below, but feel free to tinker with them! You can make a hoisin ginger dressing instead of the miso dressing: Combine 2 T hoisin, 1 T rice wine vinegar and 1/2 tsp minced ginger, then toss that with the green beans, plums and pickled daikon. Pickled daikon can be bought from Japanese or Korean supermarkets, or you can make a quick pickle with daikon, white vinegar, sugar and salt. I eyeball this and go heavy on the vinegar, light on the sugar and salt. Click here for a recipe if you want actual ratios. Heat a bit of oil in a medium pot or pan. Add the garlic and saute until fragrant, then add the green beans and cook to your desired doneness; I prefer crisp-tender. Remove from heat. Mix the sesame seeds, miso, vinegar, mustard, honey and sesame oil in a medium bowl. 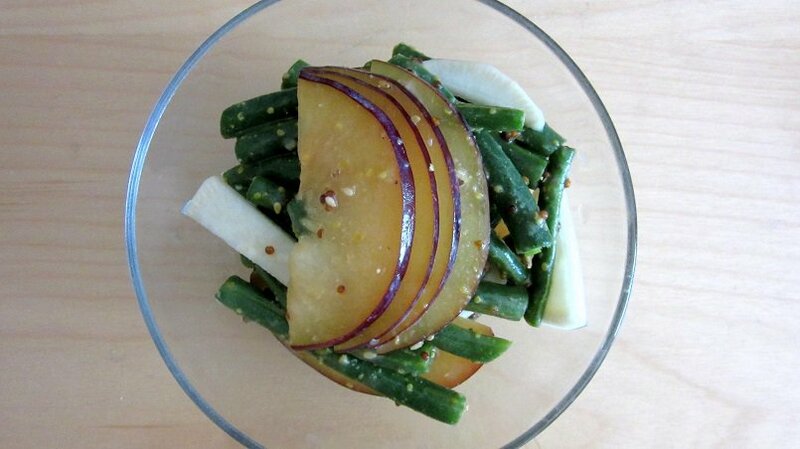 Add the green beans, plums and pickled daikon, then toss until evenly coated. i love how adding just a dab of miso makes things so flavorful! and banana bread sounds delicious. maybe with your miso caramel? (; i’ve heard good things about that stuff!